Posted in VORTEX2 News on April 6, 2009 by Susan Cobb. 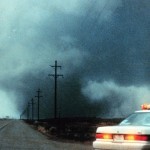 A collaborative nationwide project exploring the origins, structure and evolution of tornadoes will occur from May 10 through June 13 in the central United States. The project, Verification of Origins of Rotation in Tornadoes EXperiment2 (VORTEX2 or V2), is the largest and most ambitious attempt to study tornadoes in history and will involve more than 50 scientists and 40 research vehicles, including 10 mobile radars.